Fill out and print our ready-to-use flyers to advertise your open house! If the team has room to accommodate the student athlete. Advice on how to plan and schedule your open house. Outline what topics should be covered in your presentation. Example announcement that can be used in school newsletters and/or bulletins. A Team Member Signup Sheet. Five Flyers that can be filled in and printed out with your open house information. 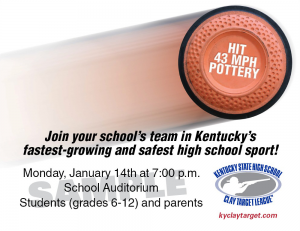 Download the KYSHSCTL Student Athlete Recruitment Kit and get your team organized today!